I mentioned briefly that I have been living by myself for a couple of weeks. It's a miracle really, something I never thought I would be able to do and yet I've made it through 2.5 weeks with only one BIG scare. No, it wasn't someone breaking into my house like I was expecting and the reason I slept with our largest kitchen knife right next to my bed. Nothing major broke in the house or emergency runs for me. Though there was that Dr. visit when my foot started hurting. There wasn't a flooding problem with the pool where mother nature made it rain for two days and I had to don my monsoon outfit to drain the pool. 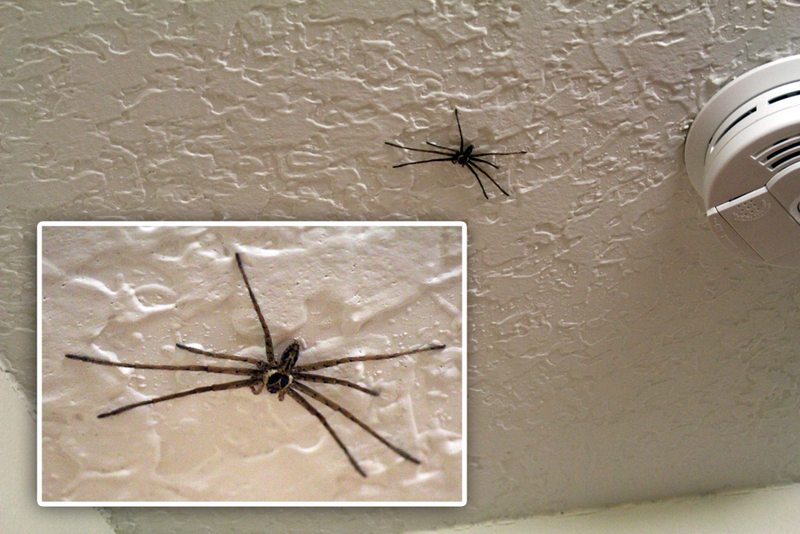 That's right, I found this HUGE spider waiting for me on the ceiling above the bathroom doorway. It stalled my going out plans and after 30 minutes of baby sitting it, I decided to call my little brother to see if he could stop by to save me. After research by my parents because even looking at them online creeped me out, they decided it was indigenous to Florida and only harmful to other creepy crawly things. I posted about my three biggest fears last year during my Truth Tuesday sessions and spiders / creepy crawly things are my #3! The worst part is I thought I could kill it myself! I grabbed a broom from the garage, found my cowboy boots and then I realized that wasn't realistic. Luckily little bro came to my rescue and killed it right away. Only 1 hour of time wasted crying over a stupid spider. I would say that even with this setback, I am really looking forward to moving out in the Spring. Watching TV whatever, whenever I wanted *cough* Sons of Anarchy *cough* was awesome!!! Not having someone harp on me for the dishes and they still got done when I wanted to /could do them. Making my own meal plans sometimes. This is HUGE for me. I'm little miss scaredy cat and I'm so thankful for this little peek at living by myself. I was told by a friend that it would be the best thing I ever did and I think she might actually be right! A dog will probably be a necessity though. I mean, I felt so much safer knowing Boomer was at home during the day and something would probably be wrong with him when I got home, right? I mean, for the first week I locked both of us in my bedroom (with my big knife) at night to sleep. After he woke me up puking two mornings the door locking stopped, lol. What's a paralyzing fear you have? Have you ever lived by yourself? The is one big spider. I have lived alone for awhile but Seamus keeps the intruders at bay. Little man barks big. ;) The watching whatever you want is nice. It's funny, sometimes spiders give me goosebumps and other times I kill it like a champ. I think it depends on how fast they move. The ones that move too fast are easier for whatever reason. Also, I use my swiffer to kill spiders on the ceiling..it's brilliant and always works! Oh my gosh, I had to scroll by that photo so fast! I think that DEFINITELY counts as a major scare! Hahaha I would have needed someone to come save me too!!! I hate dealing with bugs, and I'd rather someone not knock on my door when I'm home alone! AHHH! I shuddered just looking at that thing! I always had my boyfriend kill anything gross. When I lived alone luckily the spiders were just normal sized ones. I react to rodents like you do to spiders. I once had a mouse in my apartment and not only didn't I sleep but I had to have a friend come check the traps for me until it was caught. Sweet baby Jesus!!! NUH UH burn the place down! Poisonous or not, spiders that look like that must die. End of story. I almost threw my laptop across the room just by looking at the photos!! What the efffff, I am now glancing nervously at my own ceiling. That is scary!! I've never seen anything like that before- no wonder you were spooked! We have these gross centipede things here that send me into a tizzy, I can't handle killing them and mostly just cry. I hate staying alone, I always keep the door locked and chairs propped under them, as if my pillow fort isn't enough to keep me safe! Being a grown up is hard. what the what is that kind of spider??? thank GOD we don't have giant things like that in toronto!!!! NO NO NO! AHHHH. Nope.